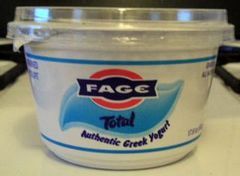 My second "restorative" recommendation is a Greek yogurt I discovered back in December called FAGE (pronounced Fa'-yeh!). The first week I arrived in Savannah I was buying groceries at The Fresh Market and was perusing the stores selection of yogurt when a woman came up behind me and proceeded to tout the deliciousness of FAGE yogurt (I love love love getting recommendations from random strangers). I proceeded to take a few containers home to see if her claims were accurate. The yogurt comes in Total 0% (zero fat), Total 2%, Total Light, and Total (full fat). The woman recommending the yogurt claimed that there was but a slight difference between the 0% and Total, so I decided to give the 0% a go. This yogurt is like nothing I've ever tasted. It possesses a rich flavor and is thick and velvety in texture. Unlike most fat free or lowfat yogurt FAGE tastes unbelievable. Just last week I was at Brighter Day buying some FAGE 2% and the woman working the register insisted the 2% tastes like you're eating cheese cake, and she is right. I typically buy the 0% and add some berries and honey or granola and honey to my yogurt. But FAGE also sells Total Honey, Strawberry and Cherry flavored yogurt, if you don't like mixing in your own flavors and sweetener. When I moved to Savannah I put all my furniture and many of my belongings into a storage unit in Bellingham. Upon arriving in Savannah at the end of December I had ten, days right around Christmas, to fully furnish my apartment. 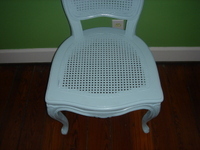 I found most of the basic furniture I needed at various antique shops around Savannah. But there were still a few pieces I was on the look out for to fill up space in my fairly large apartment. At work on Thursday my boss brought this chair out on the floor and I was instantly smitten. Typically when it comes to purchasing furniture I need at least a few days to rationalize the purchase. 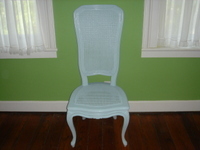 But I knew the chair would get snatched up quickly if I debated over the purchase another day. So I went ahead and bought it, and with my employee discount I got a great deal on it. 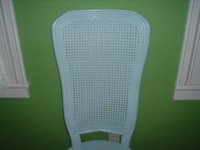 The chair is double caned, pale blue, and French in origin. I think more than anything I was taken with the scale of the chair. It's almost reminiscent of the seating in the Mad Hatter's tea party and it suits my bedroom perfectly. I've decided to add a new category that I will be blogging about here at Entre Nous, titled, "restorative". I'm trying to lead a healthy lifestyle and implement healthful living into all aspects of my life and would like to share with you some of the discoveries that are helping me do so. At least once a week I'll share products, books, magazines, food, drinks, exercises, places etc., that I've found helpful to me personally as I strive to incorporate health consciousness into my daily life. I'm assuming that some of you might be trying to lead a healthy lifestyle of your own and hopefully you'll share some of your discoveries with me. 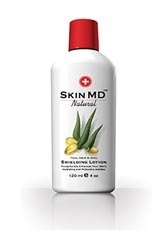 The first restorative product I'd like to recommend has to do with caring for your skin and is called Shielding Lotion by Skin MD Natural. It is made of all-natural ingredients: water, aloe vera, vitamin E, comfrey, chamomile etc. It is also fragrance and colorant free. This lotion not only moisturizes your skin, but it protects it from irritants and toxins your skin is exposed to everyday. It safeguards your skin from the negative effects of some soaps, and cleansers, and reduces the loss of natural oils and moisture. You are left with skin that is hydrated, healthy, and smooth. Also worth mentioning is the fact that Skin MD Natural does not test on animals. You can find out more information about this product by following the link to their website. The lotion can either be ordered through the website or check out the store locator link to find out if a store near you carries the product. Be warned, a small amount goes a long way. I just happened to be running some errands around Broughton St. (post office, bank) today when I stopped into @ Home to look for a Birthday present for my sister. Out of the corner of my eye I spotted several people carrying Marc Jacobs shopping bags. It turns out today was the stores "soft opening". The Savannah store is apparently the biggest Marc by Marc Jacobs store to date. The store still smelled like paint and could have done with a good dusting. Marc Jacobs was not on hand (still in rehab?) [edit: Marc was not in rehab but rather shopping at Barneys in LA with Naomi Campbell]. But his business partner Robert Duffy was there in his place. Someone commented that the store had the appearance of an Old Navy, and I would have to concur. The clothes were packed tightly together up against every wall, making them difficult to browse through. While on the floor there were bins filled with t shirts, bags, compacts, pins, etc. There were four items I just had to have: a belt, a bag, a compact, and a lipstick pen. While my purchases were being rung up I had to wait a good long time while a photographer from Women's Wear Daily snapped a staff photo. I do know that Marc Jacobs will be in Savannah next month. On May 19, Jacobs will receive the Andre Leon Talley Lifetime Achievement Award from Savannah College of Art and Design at the school’s annual student fashion show. Talley and Paula S. Wallace, SCAD president, will present the award. Luckily I got out of the store without spending more than $50. I'll be back though, there's a Pan Am bag I have my eye on. I wanted to give everyone a heads up that Catherine Deneuve's memoir The Private Diaries of Catherine Deneuve: Close Up and Personal is coming stateside May 1st. Seriously, is May not gearing up to be the best month of this year so far? The book was described as being, "marvelously opaque diaries of the great French cineaste" by The Observer. "Despite her international appeal, however, Deneuve has always chosen to avoid the ferocious glare of Hollywood and seldom allows the public into her private life. In these memoirs, Deneuve takes the reader behind the scenes of her life and career in this fascinating collection of seven previously unpublished diaries that she kept while filming abroad." I for one am counting down the days until April showers bring May flowers.